Whether you have a breathtaking view or you’re fashioning one with your kitchen remodel, you definitely want to get the most out of it. 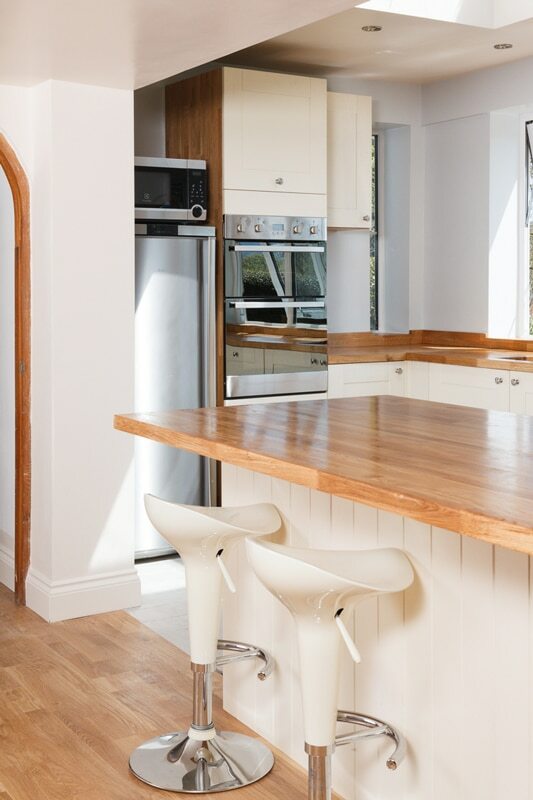 Have a look at this amazing customer’s kitchen with a beautiful open and airy design that still maintains a heady understatement. Every inch of the kitchen provides a pleasant aesthetic, but it all comes together to form a frame for the beautiful countryside view. Follow our great kitchen remodel tips to accomplish a similar outcome for your kitchen. Making use of a peninsula + breakfast bar in dividing the kitchen up is a phenomenal method for maintaining an open and airy feel. It’s a choicer alternative to installing a small kitchen island and making that a part of your kitchen design. Had the owners placed a wall and door in this spot, it would have not only closed off the cook space, but barred the amazing view from more of the home. The peninsula increases the inviting sense of the space and the living room is positively flooded with incoming light. The inviting aspect of this element is even more extensive than that, though. The breakfast bar faces directly towards the entire kitchen as well as those irresistible views, meaning that all guests can be entertained by the chef while preparing food. This multi-use space featuring beautiful traditional white cabinets blends the best of cooking and living areas seamlessly with a thread of light through the central peninsula. 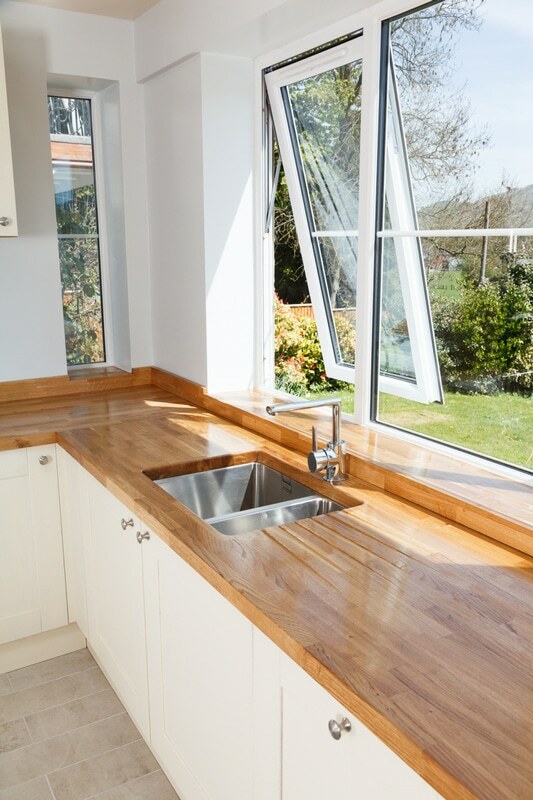 Extending the worktop edge outside of the kitchen floor confines further bonds the rooms. This open kitchen design obviously benefits immensely from the large windows virtually covering the back wall to maximize the view. Coupled with the impressive skylight in the center of the space, light infuses the area. Appliances and other distractions are minimized in the path of the view as well, leaving only the sink there for the chef to enjoy while washing. 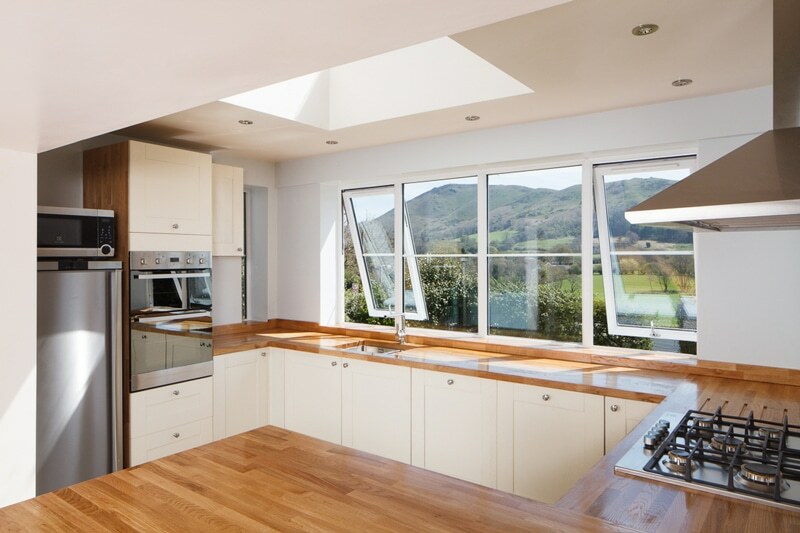 Lighting is an important factor in any kitchen and a skylight can help immensely with that. In order to prioritize the available view in the backdrop of the kitchen, the remodelers elected for a neutral color approach. White walls, off-white cabinets, and a light oak worktop provides an elegant but muted beauty that doesn’t detract from the view. Virtually any kitchen can benefit from such a color strategy, even if your beautiful view is a work of art rather than an outdoor vista. Finally, using stainless steel appliances and fixtures completes the tapestry of neutrality. This sensible and modern kitchen is just at home in the countryside as it would be in the heart of the city. And in either environment, it provides a social atmosphere for the family or guests to relax and engage with one another distraction-free. Considering your open open space kitchen with beautiful white cabinets? Have a look at our selection today! You can order sample doors in order to see exactly how they’d look in your kitchen, or even speak to one of our friendly and capable designers.